The following terms designate portions peculiar to Gothic structures. Arches were distinguished by several forms, of which the following are the chief. 3. 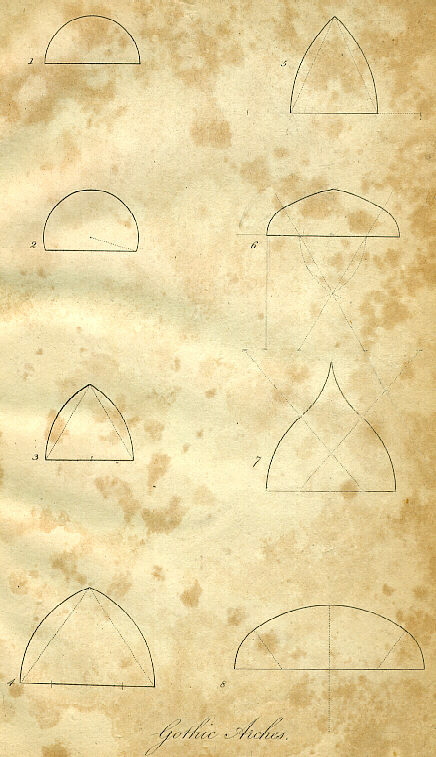 The pointed arch, described about an equilateral triangle. 4. The drop arch, about an obtuse angled triangle. 5. The lancet arch, about an actite angled triangle. 6. The tudor arch, from four centres. 7. The ogee or contrasted arch, from four centres. 8. The elliptical arch, from three centres. Arch-buttress, (arc-boutant), an arch springing from the outer wall of the aisle and butting against the clerestory. Base court, (basse cour), a large court belonging to a castellated mansion, around which were placed the offices and stables. Battlement, the part above the cornice cut into embrasures or crenelles, sometimes the merlons are perforated with oillets and loop holes. Bay window, one that projects in two or more planes beyond the face of a wall; a bow window, one that forms the segment of a circle or ellipsis. A bay window is also termed an oriel, and a compass window. Bench table, a low stone seat around the columns in the interior of a church, and along the walls. Billets or billetted mouldings, cylinders carved into short lengths and applied on any flat member, chiefly to be found in buildings of the Norman style. Boltel, the shaft of a clustered column. Bosses, round projecting flowers placed at the extremities of raised mouldings, or at the junction of ribs in a ceiling, vaulted roof, or series of pannels. Branches, the ribs of a vault branched work is any foliage or ornamental carving. Buttresses, the parts projecting square or angularly at the corners of a building between the windows on the sides, standing parrallel to the side wall; they are divided into stages by sloping tablets called set-offs. Campanile or belfry, a tower for bells. Canopy, an ornamental dripstone, generally of a curved figure, over doors, windows, or niches. Casement, a light within the mullions of a window formed by a slender frame work; also a hollow moulding resembling the scotia. Catherine wheel window, a term made use of when the tracery in the head of a window is formed into a large circular moulded band, divided into several compartments, which radiate and terminate with small arches at the circumference: the same term may express also any circular window. Chapiter, the capital of a column. Chevet, the semicircular or polygonal termination of any church or building. Closet, any private room or small retiring chamber. Corbel, a bracket projecting from the wall to support an arch, niche, or figure. Corbie-steps, the battlements when rising like steps on the tops of gables. Crest-tiles, ridge tiles covering the tops of roofs, and often very ornamental. Crockets, small bunches of foliage, ornamenting the sides of pinnacles, canopies, and gables. Dern, a door post or threshold. Diaper, a carving of raised flowers, or painted and gilded flowers, or coats of arms, in a panel or on a wall. Entail, (entaille) ornamental carving upon stone or in wood, of the finest description; that of a less delicate or minute kind upon stone is called fret-work. Finials, the large bunches on the apices of pinnacles, canopies, and gables. Gable, the end wall of a building formed into a pyramidical figure at the upper part. Gargle, the carved head of a serpent or animal of any kind, pierced so as to be used as a water spout, placed often along the cornices and other projections. Gradatory, (gradus) the ascent by steps from the cloister to the choir in some churches: any place to which the ascent is formed by steps. Groin, the hollow formed by the intersection of two or more simple vaults, crossing each other generally at the same height: the diagonal lines formed by such compound vaulting, are the constructive lines of the groin, these are called cross ribs or cross springers. Hatched mouldings, triangular carvings applied as ornaments on flat members. Label or Hood mouldings, the outer mouldings round window or door heads, either following the curve of the arch or running square, with a return at the ends, or terminating with a carved head or flower. Lantern, a small tower or steeple glazed on the sides; the opening into a tower above the roof is also called a lantern. Mullions, the vertical mouldings which divide windows into lights. Munnions, the jamb mouldings, and also those in the window heads dividing the several compartments into bays or lights. Nebula, a projecting moulding terminating on either side in an undulating line without angles. Nerves, the mouldings of the groined ribs of Gothic vaults. Ogive, the branch of a vault passing diagonally, and thereby forming a cross with the other ribs; the middle where the ogives cross each other is the key, and is generally cut in the form of a rose or other flower. Orbs, the bosses or knobs at the intersections of the ribs of a vault. Panel, a small compartment enclosed with mouldings, and often enriched with quatrefoils or other ornamental figures. Parapet, the part above the cornice carried up in a straight line along the top to cover the gutters on the roof. Perches, projecting corbels or brackets within churches, used as stands for small images or candles. Piers, the solid parts between arches, below their springing. Pinnacle, a small ornamental spire used externally, chiefly on the tops of buttresses, and also internally for decoration. Responder, a half column or pilaster attached to a wall, to correspond with the other columns. Rood tower, that which is built over the intersection of the nave and transept in a church. Rose window, one ramified as a Catherine wheel window. Sill, the projecting stone under a window or door. Spandrel, the solid part above a pier between the springing and crown of an arch. Spire, a pyramidal or conical erection crowning a tower or turret. Stanchions, the vertical bars of iron to divide the panes in windows. Steeple, a building of any form above the roof. Strike, an iron spear in a gate or railing. Tablets or Tables, small projecting strings, mostly in a horizontal direction, the lowest is the earth or ground table; the tablet running round doors and windows, a dripstone; the upper tablet, a cornice; a projecting parapet or cornice resting on corbels, a corbel-table. Tower, a building above the roof with its top square when it is of a great height, and small in diameter, it is then called a turret; when the upper part of a tower is projected from the main wall, and is supported by corbels, it is called a corbel-tower. Tracery, the ornaments of the divisions in window heads; when the lines branch out in the resemblance of leaves and other figures, they are called flowing tracery; when the mullions run through in straight lines, perpendicular tracery. The parts of tracery are ornamented with small arches and points, called foliations or featherings, the points are cusps; if these small arches are again subdivided in their curve by another cusp, this is called double feathering. A series of these small arches and cusps immediately connected assume the names of trefoil, quatrefoil, cinquefoil, according to their number. Transoms, the horizontal mouldings dividing the lights in windows; an ornamental lintel over a door or opening. Traverse, a gallery, loft or vaulting, crossing some part of a church. Trellice, a screen of open metal or wood work. Vault, a roof arched with stone, brick, or ornamental; the under story of a church or other building. Zigzag moulding or cheveron, a carved Norman fretwork, formed diagonally with salient and re-entering angles alternately joining the sloping sides, as an ornament for a moulding.